The Culture Secretary Jeremy Hunt has blamed a lack of funds for the government's decision to delay the roll out of 2 megabits per second broadband in the UK. The previous government had set 2012 as a deadline for network to be in place. Mr Hunt said he did not think there was "sufficient funding in place" to meet that goal. Steve Robertson, chief executive of BT Openreach, told BBC 5 live's Drive programme that the goal could not be achieved without around £2bn in public funding. "Last month, I announced that we were supporting a universal service level of 2 Mbps as the very minimum that should be available," said Mr Hunt at an industry conference on 15 July. "I have looked at the provision the Government had made to achieve this by 2012. And I'm afraid that I am not convinced that there is sufficient funding in place. "So, while we will keep working towards that date, we have set ourselves a more realistic target of achieving universal 2 Mbps access within the lifetime of this Parliament," he added. The government says industry must find ways to solve the problems. But, other than £175m set aside from the Digital Switchover project, there is little new money available to fund these rollouts. Mr Hunt told BBC News that the costs "had been scoped out" and he was confident "we should be able to deliver on our commitment." "Obviously we are looking for solutions that allow extensions to superfast [broadband]. It would be a short-term fix if two megabits was the limit," he told BBC News. He said the levy on the BBC licence fee used to fund digital switchover could be extended if necessary. Mr Hunt is hosting a conference intended to mobilise companies on Thursday. "Tomorrow I will bring together the key industry players who can help deliver this. I now need them to work together on solutions and tell us what we can do to help make this ambition a reality," he said. Companies will have the chance to identify the current barriers to providing basic level broadband in rural areas as well as suggesting ways to make more use of publicly-owned networks, such as those connecting schools and hospitals. BT said that public money to the tune of up to £2bn will be needed to put Britain at the top of the super-fast broadband league. The money could come from local authorities, central government or the European Union. 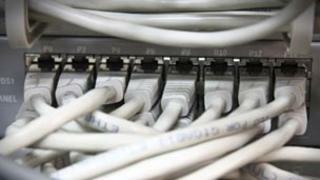 The telco is spending £2.5bn installing fast broadband services to around two-thirds of UK homes. But a significant number could be left in the slow lane. "As a society we need to make our minds up about what is an essential element of our social fabric. Today not having broadband makes people feel deprived," said Steve Robertson. The government is conducting a paper trial to work out how much it would cost to provide areas with slow broadband with faster services and will run pilots in three areas when the cheapest options emerge. Research firm Point Topic estimates that around 2m homes are currently unable to get speeds of 2Mbps. Some are in remote areas but others, such as Surrey village Ewhurst, are close to large towns. Point Topic analyst Tim Johnson fears the government may have more work on its hands than it realises. "These two million premises are not in clearly defined areas. The only way to reach the have-nots is to engineer a service upgrade for the whole area," he said. That could bring the total number of houses needing upgrades closer to 5 million, which would cost the government more. "There is a danger that a shortage of money and the search for clear wins will drive the two-meg minimum programme to concentrate on areas which are very remote," he said. A few smaller firms, such as Rutland Telecom, are taking matters into their own hands and raising money from householders to improve broadband services in small communities. But the process is made harder by BT's withholding of vital data. In order to make decisions about how much it will cost to provide fibre to a community, firms need to know which homes are connected to which green street cabinet. Rutland Telecom says BT has refused to hand over this crucial data. "We have a manual process for advising Rutland Telecom of the location of the street cabinets and Ofcom has confirmed that by providing this we are fully complying with our regulatory obligations," said a BT spokeswoman. If more firms need such data in the future it may consider offering an automated system, the spokeswoman said. Sorting out relatively minor regulatory issues such as this could make a big difference, thinks Tim Johnson. "Obliging BT and similar companies to open their infrastructure data to the market is the single most effective measure the government could take to create the super-fast broadband network it wants," he said. Mr Hunt said persuading companies such as Rutland to invest in broadband was "absolutely part of the process". "We need a level playing field and have to make it easy for people to lay fibre in BT's or other's ducts," he said. He said new legislation may be required to open up the ducts of electricity and water companies.